From a cubic concept kitchen and Jaime Hayon’s fantastical folklore-inspired quartzite furniture to the best from Umbra’s prototype contest, Azure’s editors have made their picks for the best moments from Toronto Design Week 2017. Speaking simply, Cubi is an empty box. 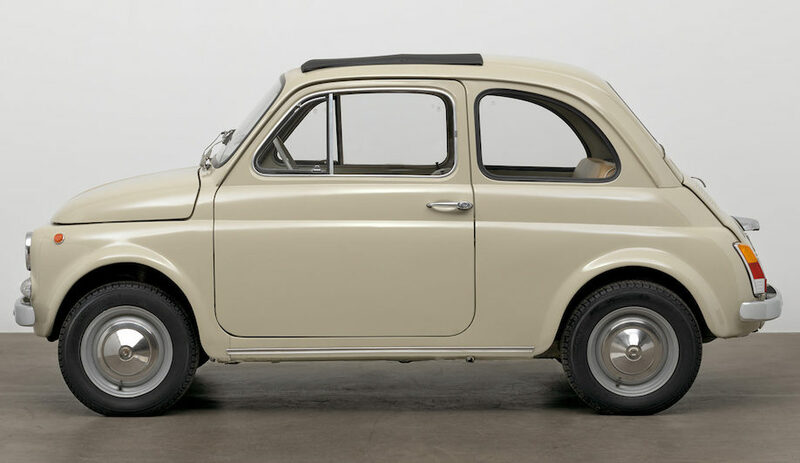 But it’s this simplicity that makes it ingeniously complex. A collaboration between custom kitchen maker Aya and Toronto architecture and design firm Partisans, the modular kitchen system is equal parts storage, shelving and room divider. 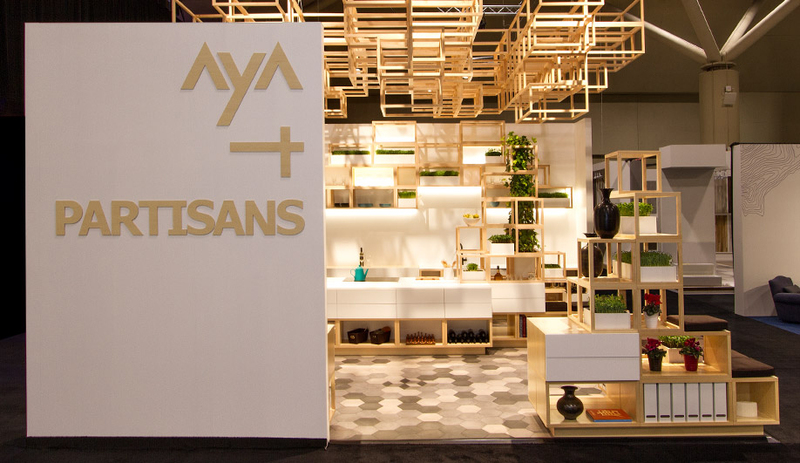 As the team’s booth – which took first place in the 400-square-foot category – showcased in spectacular fashion, the flexible nature of the basic geometric form is endless. 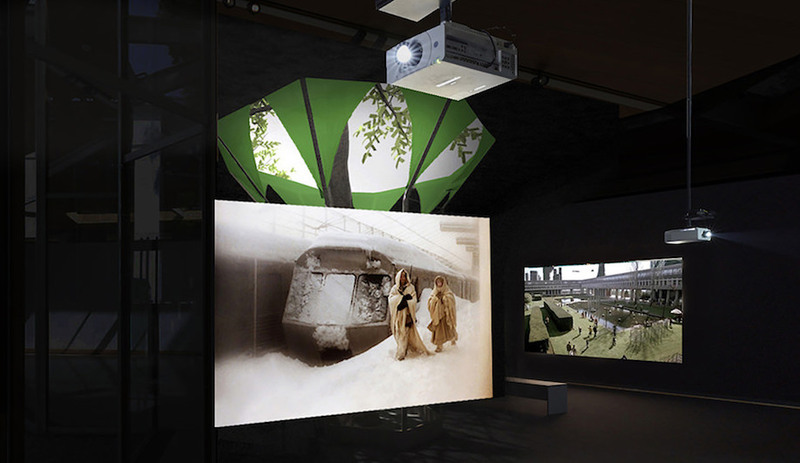 A response to shrinking living spaces in ever-expanding cities, the completely customizable concept would offer homeowners functional control over how they make their spaces work for them. From one familiar form comes walls, benches, cooking areas, dining surfaces, indoor gardens, and so much more. Of course we would be remiss to not mention Partisans’ other scene-stealing setup on the show floor, where they were decked out in top-to-toe silver hand-crafting made-to-order Gweilo lights. For the second year in a row, the Spanish surfacing company teamed up with Toronto design firm Cecconi Simone to showcase the versatility – and undeniable beauty – of their innovative composite material. Once again, the partnership proved fruitful with the finely tuned booth this year nabbing first place in the 601-square-foot-and above category. 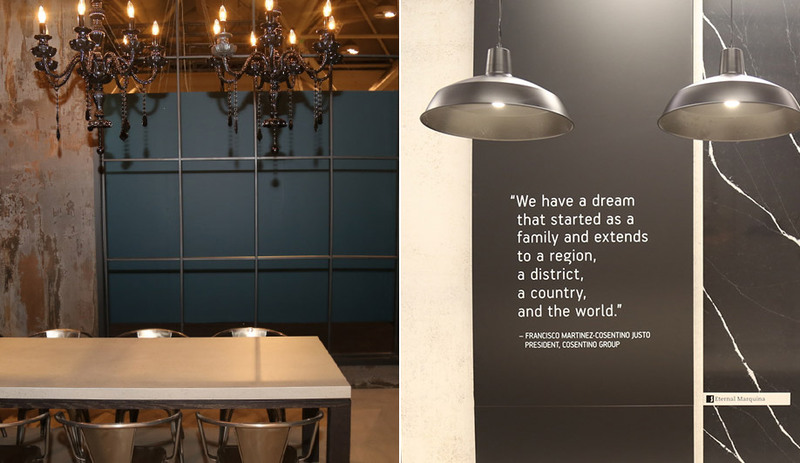 Clad floor to ceiling to walls in the latest launches and prototypes from both Dekton and Silestone (the brand’s natural quartz surfaces line), the inviting display’s layout unfolded like that of a modern city home, complete with indoor-outdoor dining area. From the gleaming white kitchen countertop to the aged and oxidized steel-look defining the outside space, it was a perfect representation of the diverse and unconventional applications of the durable material. Annie Tung’s Peak Vase (far left) and Chroma Curio Shelves (near right); Ribbon Light (near left) and Traden Lights by Brad Turner. 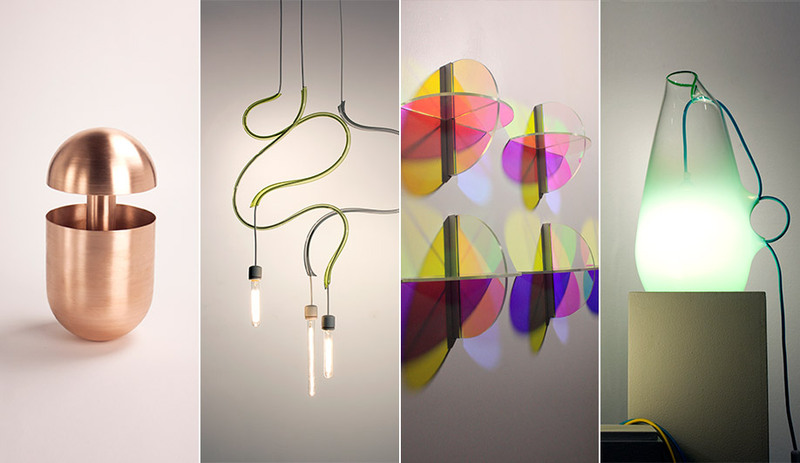 MADE Design was once again a showcase for outstanding new works by Canadian designers. 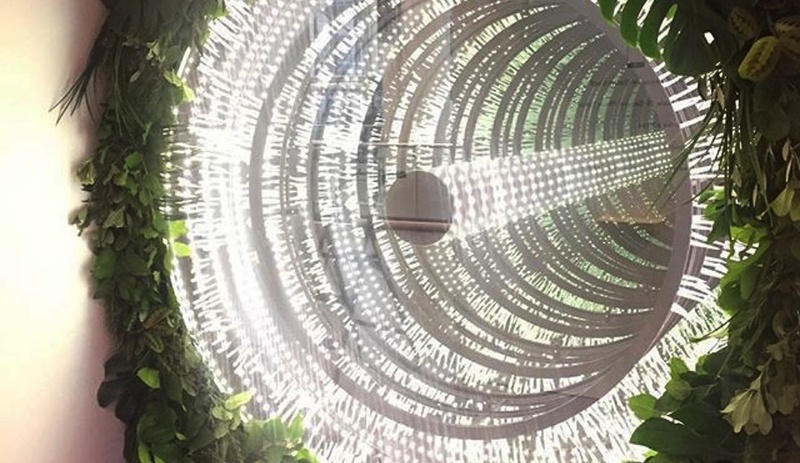 This year, the spotlight was turned on Vancouver designers Annie Tung and Brad Turner, who creatively incorporate such materials as spun copper, carved stone and mouth-blown glass into their original works. The exhibition featured some of the duo’s newest products and experiments, including stunning suspension and table lights, vases, mirrors and shelves. This annual feature of IDS seeks to promote the design possibilities of Ontario-sourced wood. 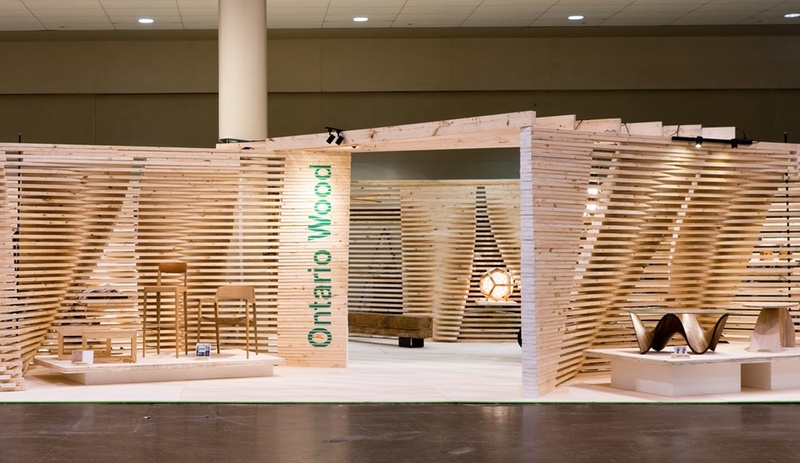 Each year, Ontario Wood, a program that supports local producers, entrusts a local design or architecture firm to create a booth that achieves that objective. For 2017, blackLAB was invited back to turn 756 pieces of sustainable aspen plywood and spruce framing lumber into an undulating, sculptural backdrop for wood furniture and lighting created by 24 different local designers and makers, including by Brothers Dressler and rekindle. 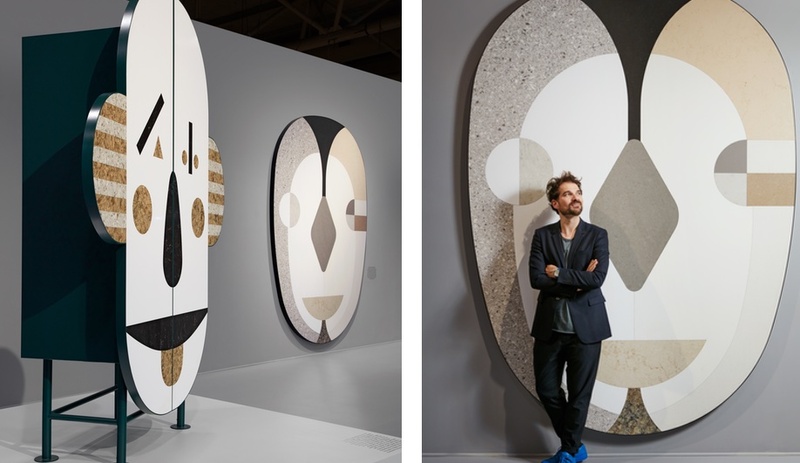 IDS has become the launching pad of Caesarstone’s annual year-long collaboration with a top designer who’s tasked with spinning the quartz surfacing into a curious concept or playful installation. Jaime Hayon took the reins this year and delivered Stone Age Folk, a whimsical, folklore-inspired collection of seven fun, yet functional furniture pieces and wall hangings. The installation occupied prime real estate at IDS, and drew in curious passerby to open Hayon’s “face cabinets” by the ears or nose. Azure web editor Jaclyn Tersigni spoke to Hayon before the show’s opening about his inspiration and process. The Gladstone’s alternative design show lived up to its reputation for creativity this year with a truly imaginative set of projects. 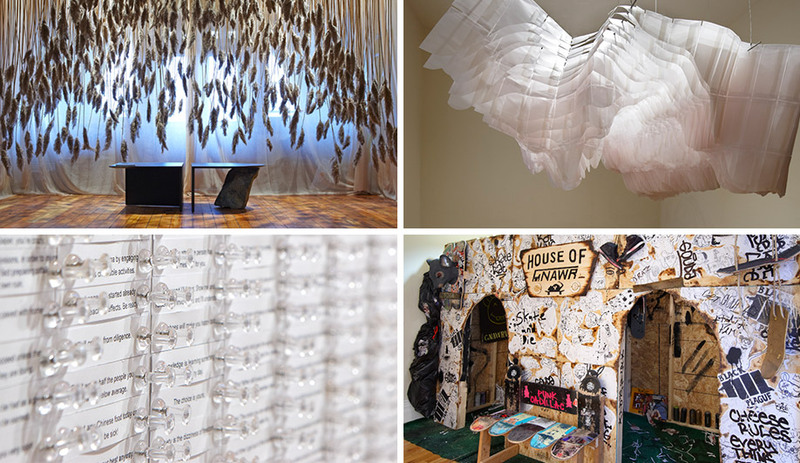 Hanging pieces like Missisquoi Alcove by Simon Johns (top left) filled the central space with a dreamy atmosphere, while adjacent rooms exhibited a wide variety of installations, from Patrick Li’s wall-to-wall Fortune Room (bottom left), to the ethereal Home-Made by 302Collective (top right) and the grungier Rat Pack Skatepark by Oasis Skateboard Factory (bottom right). Delightfully offbeat and now in its 14th year, CUTMR has become the official counterpoint to the IDS main stage. When real estate is expensive and space is hard to come by, efficient living is a must. Designers, in response, have begun to think about creating solutions for ever-tighter living quarters. (In Toronto alone, condo sizes have shrunk by an average of more than three square metres in the past decade.) And so, at Umbra — a store that’s no stranger to efficient home accessories — the Compact Living exhibition featured the work of a dozen Canadian designers on all things economical. 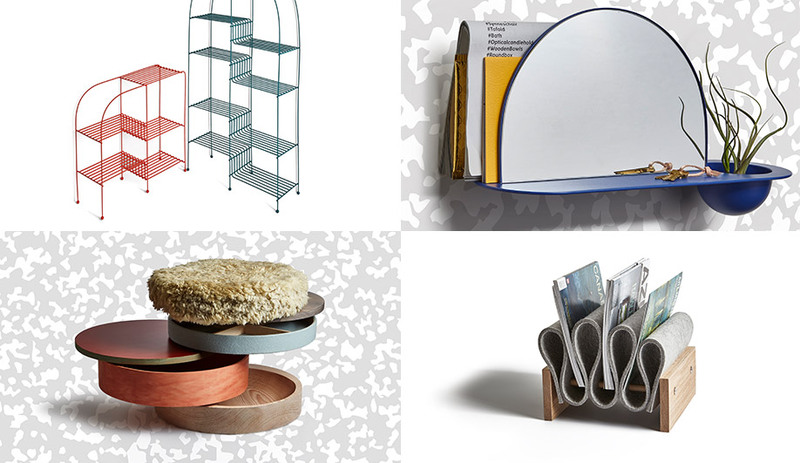 Whether it was a wall-mounted mirror-slash-shelf by Chifen Cheng or a concertinaing magazine rack, these items got us thinking about how to live a neater, more pared-back existence. There was plenty to take in at IDS, but one kiosk that repeatedly piqued the curiosity of attendees was the Infinity Mirror Selfie Booth. 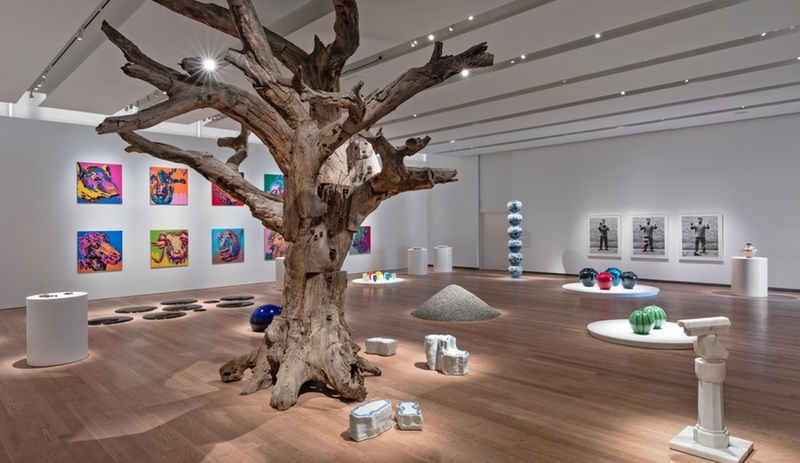 Alison Milne Gallery partnered with Astound Group to put the piece together. At the heart of it lies artist Erin Vincent’s cast plaster installation, entitled Dualities, where rows of tiny menacing horns extend into seemingly interminable space. The installation is framed with greenery provided by local garden boutique, the Urban Gardener. Even in the midst of world-class design, who can resist a good photo op? This exhibition saw 17 students from OCAD’s Industrial Design and Graphic Design programs present works-in-progress by way of prototypes and full-scale models. 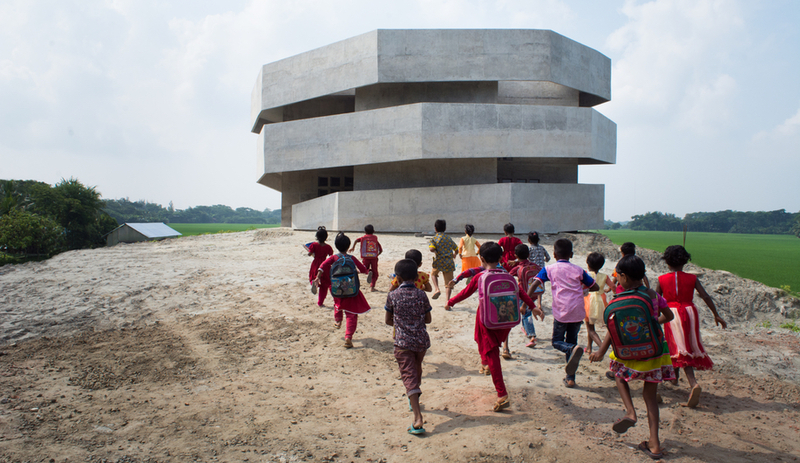 Each project proposed a design solution for a wide range of global issues – gender equality, immigration, automation, urban agriculture, and etcetera. 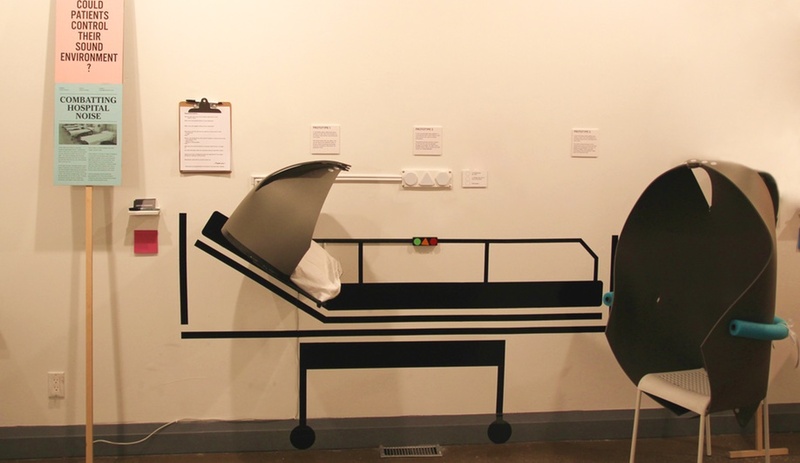 Kristen Thomson, a fourth-year Industrial Design student, introduced Quiet Please!, a collection of objects intended to help dampen excessive noise levels found in hospital patients’ rooms. The World Health Organization recommends a maximum decibel level of 35 in patient rooms, yet average daytime levels sit at 72 dB, a number that studies say is linked to slower healing rates. Fellow student Stein Wang tapped into a hot topic with Now You See Me, a project that addresses the racial bias faced by Chinese and East Asian immigrants when venturing into the Canadian workplace. 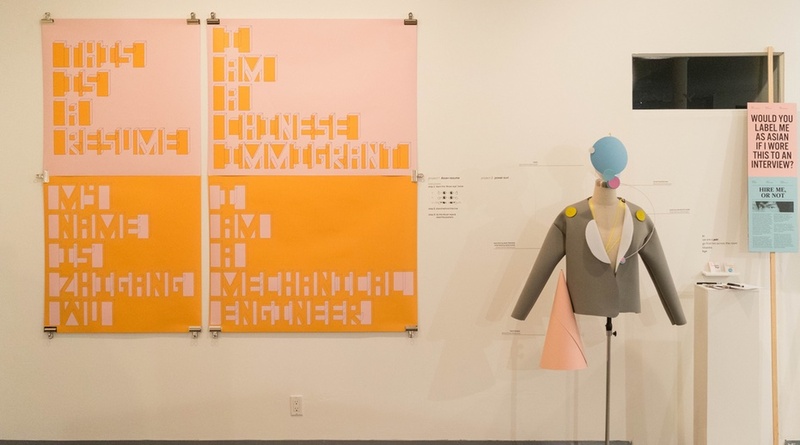 One element instructed visitors to pull back the corners of their eyes in order to better read poster text, while another proposed a “power suit” that a candidate could wear to mask their ethnicity while boosting their performance.